Sixty years ago a pleb might live in a tight-knit, urban, ethnic community. The neighborhood would have very low crime, safe schools, and strong churches. Censorship laws promoted family values in movies and on TV. 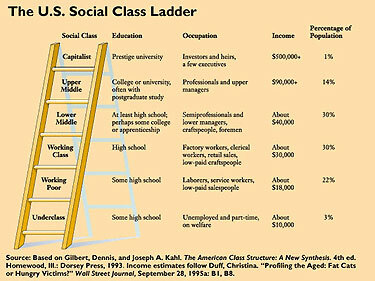 The upper class would live blocks away from the lower class. In ensuing decades, a combination of demographic changes, “urban renewal” projects, and legal changes rocked this world. The great migration brought into the city a poor, uneducated African-American population from the south. This migrant population had a much higher rate of criminal behavior. Housing projects and forced integration mixed this population into the ethnic white enclaves. Legal changes made policing much less effective. Crime in these neighborhoods rose dramatically. Court rulings and policy changes stripped public school teachers of tools to discipline unruly children. After these changes, the only way a person could avoid a high-crime neighborhood was to move to a neighborhood where the underclass cannot afford to live. If a parent wants to send their kid to a school where class is not continually interrupted by underclass children, they must send their kid to a school with no underclass children. That means they must buy a home in a school district where the underclass are priced out. Parents use the coded, politically correct language of “finding a neighborhood with good schools.” But in reality, school spending, pedagogy, and teacher qualification do not differ much between the underclass inner city and suburban neighborhoods. What parents are really doing is “finding a neighborhood with good students”. Schools no longer view instilling traditional morality and character as part of their mission. The Hays code that guided movie censorship is long gone. As a result, parents must take on the full burden of controlling their children’s media intake. Parents must live in neighborhoods where the other parents uphold the same values, otherwise their children will pick up the wrong values from their friends. Some plebs manage to work extra hard, stress finances to the max, and buy their way into a classier neighborhood. But they will live on the edge – a layoff or furlough could bankrupt them. Their landlord will boot them right back into the underclass neighborhood. Many plebs cannot afford to exit the underclass neighborhood. They live in neighborhoods with high crime, drug dealers on the street, and wild schools. They might get mugged on the street. Their children may end up falling into drugs or a gang. Their daughter might follow her friends and get knocked up at 17. The pleb who remains in the underclass neighborhood lives in constant danger of falling into the underclass. 5 Feedbacks on "Economic and Social Classes Today"
This is why school choice has such tepid support in suburban communities. The residents paid an inflated price for real estate in good school districts. School choice would remove the demand that supports continued high prices for their investments. As usual, follow the money. Parents might have wanted to move their kids into safer, more successful neighborhoods/schools to get away from the physical depravity, but these days television, and even more the internet, are open sewers emptying into their own living rooms regardless of where they live. Or should I say emptying into their kids’ back pocket or wherever they keep their smart phones. The depth of social, psychological and emotional depravity available to kids is stunning. The idea of moving into the “best” schools and neighborhoods to try to avoid all this means nothing anymore. The author is too gloomy and too preocuppied with government solutions. What is forgotten is the need to lower the costs of basics. Where is the stripped starter car, the small starter house, the basic but adequate service that raises the standard of living at a lower income level? Much of the increases are due to government regulation. Every green or safety requirement that brings marginal benefit at high cost hits the lower income groups. Plenty is spent on the “underclass” for schools, medical care, housing subsidies and policing, but if you bring in millions of low skilled illegal workers how would is work otherwise. It is not just illegal aliens. Every year LEGAL immigration brings in about 1 million Black and Brown LOW SKILLED future Democrats and every year brings in more than 100,000 mostly Muslim refugees Black and Browns chiefly without skills and also future Democrats. Then there are the more than 60,000 H1Bs (who rarely go back) each year displacing America’s own engineers as they work for peanuts.